1 - Can I change or cancel my order? Orders may only be canceled or changed within 24 hours of being placed, provided they have not already begun the shipping process. To request a cancellation, please contact customer service by filling out the e-mail request form HERE. You may also call us at +98-21-44005650, or request assistance via live chat. Cancellation requests are processed during normal business hours. Please keep in mind that as all orders begin processing immediately once received, cancellation cannot always be guaranteed. We strongly advise that you carefully review the details of your order prior to finalize your order. 2 - Can I hold parts of my order? 3 - How long will it take to receive my order? In stock items usually leave our warehouse within 1 - 3 business days. Lead times prior to shipping vary by each product. "Lead times" are the estimated number of days it takes for order items to be prepared for shipment. Once your order has shipped, it may take an additional 4 - 7 business days for actual delivery. 4 - Are the colors on your website accurate? The images we display have the most accurate colors possible. Please keep in mind that color variances may occur with handwoven rugs and carpet. 5 - Will the sizing vary from what’s listed? We do our best to provide you with the accurate dimensions of all products, but please be advised that variations may exist by up to 2% of the published dimensions. This is normal and is not considered a defect. 6 - How do I care for my area rug? Vacuum regularly. Do not use a beater bar attachment. If you cannot remove the beater bar, raise it as high as possible and vacuum carefully. When vacuuming, use the lowest available setting to prevent fibers from being pulled out of the rug backing. Sprouts that appear on the surface of the rug should be snipped at level. Do not pull the fiber out. 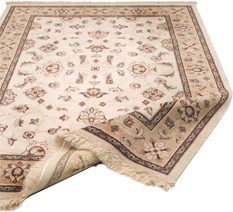 If you own a natural fiber rug, be sure to vacuum the area underneath the rug periodically. Spills should be cleaned immediately using a clean white cloth. Avoid rubbing, as this may push the stain deeper into the rug. To promote even wear of the rug surface, rotate regularly. Avoid exposing rugs to continuous direct sunlight. This will cause colors to fade over time. For deep cleaning, professional assistance is highly recommended. 7 - Will my rug require a rug pad? On hard surfaces such as wood and tile, we highly recommend the use of a non-slip rug pad to keep your area rug from sliding around. 8 - My rug is shedding, is this normal? It is normal for new rugs to shed yarn fibers. Depending on the weave type of your area rug and where it is being used, it may continue to shed over the span of its lifetime. Proper and regular vacuuming will help pick up rug fibers and keep the rug looking fresh and clean. 9 - What are the shipping costs? At CPERSIA, shipping is always FREE to all over the IRAN. If you are shipping your package to outside of IRAN, please be advised there will be shipping charges which will vary depending on destination. Additionally, you will be responsible to pay any duties, brokerage and customs fees to shipping company upon delivery. 10 - How will my item ship? If your order is in regular size we generally ship packages with Aramex to outside of IRAN. Over-sized packages that are too large or heavy to ship with Aramex will be shipped via freight forwarders. If you want to deliver your order inside IRAN, we will deliver via domestic shipping companies which provide door-to-door services. 11 - My item shipped Freight. How do I track it? When your items ship, a bill of lading or PRO number will be provided. To track an Aramex Freight shipment, click HERE. You will be contacted by the Freight carrier to schedule a delivery appointment. Items will be delivered curb side of the address. Please carefully inspect your order upon delivery to ensure the merchandise is not damaged. If the packaging shows visible signs of damage, open the item immediately to check the contents and ask the driver to inspect them with you. Write a precise description of the damage on both your copy and the carrier's copy of the delivery receipt. If you feel like the merchandise is damaged beyond repair, please refuse delivery and contact us as soon as possible to report the damage. 12 - Do you ship internationally? Yes, we do ship to some countries which are listed. You can check these countries during your order. 13 - Can I refuse delivery of my item? Refusals are allowed only in cases where the merchandise has been damaged in transit. If an item is refused for reasons other than damage, a 25% restocking fee may apply. 14 - What is your return policy? You may return an item for a refund of the purchase price within 15 days of delivery. Return shipping costs are the customer's responsibility. To initiate a return, click HERE and enter your email address and order number to get started. 15 - How do I return an item? Items eligible for return must be within the accepted return date and in the same condition that it was delivered to you. Please note: The majority of the items we feature, including all area rugs, are shipped individually wrapped and with unique tracking numbers. Any return items must be shipped back in the same manner as they were received. To initiate a return: Enter your order number and email address here. Assuming your order is eligible for a return, click on the request a return button. On the next page, choose the reason that best describes your reason for return along with how you would like to ship it back to us. A return authorization number will be issued; be sure to clearly write this number on the outer packaging of your area rug. Otherwise, your return may be refused or incur a 25% restocking fee. 16 - How long do I have to complete a return after receiving my RA#? Once you have received a Return Authorization number, your return must be completed within 10 calendar days. To ensure your refund is processed in a timely manner, please make sure unique tracking numbers are assigned to each of your return items. If you have chosen to use your own carrier, please send your return tracking numbers by email to us. Include the order number, name on the order, and Return Authorization number. Be sure to save your shipping receipt and tracking information in case we have any questions. If we do not receive your tracking details we are not responsible for any delays in processing your credit. 17 - Will I have to pay for the return shipping if I decide to return my item? Yes. We are not able to offer free shipping for returns. 18 - How much will return shipping cost? For quotes on return shipping via any major carrier, please contact the carrier directly. 19 - How do I exchange an item I purchased? Unfortunately, we do not allow direct exchanges for any items purchased via our website. Your original purchase must be returned. You may place a new order at any time before or after your return has been completed. Note: return items related to an exchange request are subject to our 15-day return policy. 20 - What are the accepted methods of payment? Cpersia.com accepts payment by credit and debit cards (Visa and MasterCard) and bank deposit. You can also make your payments cash on delivery (COD) only if you want to take your delivery in Tehran. 21 - Can I split payment between multiple credit cards? Unfortunately, no. Only one method of payment is accepted per order.